Throughout her 40-year career in documentary filmmaking, Barbara Kopple has often focused her lens on people who are studies in perseverance. The courageous wives of the miners in Kopple’s Oscar-winning 1976 debut, “Harlan County, U.S.A.”, put their lives on the line—as did the filmmaker—to stand up for what was right. They set the tone for practically every one of Kopple’s subjects that followed, from the Dixie Chicks risking their career by exercising free speech in 2006’s rousing “Shut Up & Sing,” to Katrina vanden Heuvel and her newspaper staff battling the decline of print journalism in last year’s masterful “Hot Type: 150 Years of The Nation.” It’s quickly apparent in the opening moments of Kopple’s latest film, “Miss Sharon Jones!”, that its titular subject is a supremely fitting addition to the director’s gallery of real-life heroines. During an upbeat pre-title sequence, the film appears as if it will settle into the rhythms of a warmhearted profile not unlike Jessica Edwards’ “Mavis!” Both films certainly earn the exclamation points in their titles, since Mavis Staples and Sharon Jones are each figures of indomitable resilience. It’s impossible to watch them onstage and not be awed by their sheer life force. Yet whereas Staples’ singing career began at a young age, Jones didn’t release her first album until she was 40. 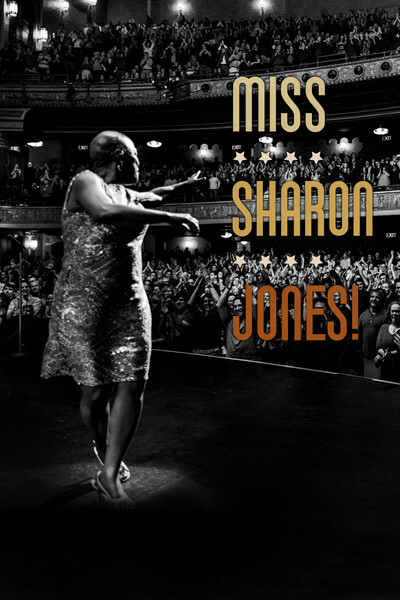 A Sony executive had dubbed her “too old, too fat, too short and too black” to achieve stardom, but she proved her naysayers wrong by evoking the essence of classic R&B with her band, Sharon Jones & The Dap-Kings. One of her key inspirations, James Brown, was an acquaintance of her mother’s, and the example he set for Jones made her “proud of her blackness.” Though Jones has only been performing with the Dap-Kings for the past couple decades, their music is so timeless that it feels as if it has been around for ages. Four minutes into Kopple’s film, however, the high spirits come to a screeching halt. Stage Two pancreatic cancer has been detected in Jones’ body, and she is forced to cut off the dreads she relished in whipping around during her tirelessly energetic performances. The new album that she’d been working on must now be delayed, and the future of her bandmates and associates is suddenly thrown into question. The wrenching footage of Jones getting her head shaved was shot by Kopple on the first day of filming, and it clearly shaped the narrative into less of a chronicle of Jones’ career and more of an observational piece about transformation. As someone who was previously unfamiliar with Jones, I would’ve liked to see more about her rise to fame and relationships with her fellow Dap-Kings. We see glimmers of this history in fragments juxtaposed against scenes of Jones, now bald but no less feisty, recuperating at a friend’s house or waiting for her next doctor’s appointment. Of course, Kopple’s cinema has always been about capturing the immediacy of the moment, and what she finds here is a woman morphing before her very eyes. With her head freshly shaved, Jones immediately starts cracking jokes about the various wigs she tries on, regarding her surreal reflection in the mirror. Few things seem to delight her more than making those around her—even the cameraman—laugh by poking fun at the ironies of everyday life. If the film is a touch more emotionally muted than one would expect, that is because Jones spends the vast majority of the film holding it together. Her life has been such a hard-fought triumph that she has chosen to view her cancer diagnosis as yet another obstacle in her path, as opposed to a death sentence. She has the sort of infectious spirit that naturally attracts wonderful companionship, and Jones has certainly found that in her devoted manager, Alex Kadvan, her ever-patient assistant manager, Austen Holman, and her holistic nutritionist, Megan Holken, who nurses her back to health. The only instance of tension bubbling to the surface occurs when Jones learns that the Dap-Kings may cancel their planned Thanksgiving dinner. She had just been invited to be on “Ellen” (“That’s like being on Oprah!”), and sorely desires to celebrate the news with the people she considers her surrogate family. Yet it isn’t long before one of her bandmates swiftly dissolves her scowl with a hug, and the laughter commences. There is, of course, a sense of unease reverberating in scenes where the band must book gigs well in advance without knowing whether their star will be well enough to perform. After receiving a worrying update from Jones’ doctor, Holman waits until her client is out of the room before sobbing softly with her back turned to the camera. She then explains to Kopple how important it is for her to remain strong, and indeed, the strength of all the key players in Jones’ life is, in many ways, as impressive as that of Jones herself. Consider her comeback concert at the Beacon Theatre where the Dap-Kings don’t miss a beat in feeding her lyrics every time they slip her mind. The audience is well aware of how momentous Jones’ return to the spotlight is, and their joyous expressions of support never subside. Equally powerful is the performance Jones delivers at church, captured in a nearly unbroken take, as she belts out tuneful praise before taking part in an impromptu dance down the aisle until she finally collapses, utterly winded. Yet the film’s emotional peak, for me, is also one of its quietest moments. Jones gives an interview that ends with her being moved to tears by memories of her late mother. At the beginning of the scene, she sings the gospel hymn, “May The Work I’ve Done Speak For Me,” a song that conveys how our works in life will stand as our legacy long after we're gone from this world. How fortunate we are to have our lives enriched by the enduring works of Miss Sharon Jones and Miss Barbara Kopple.